OneTrueFan has been added to my blog. I added because I would love to be able to get more feedback from people who visit and read my blog. I appreciate everyone who stops by even those who disagree with me and the things I believe. This is why I have an open policy for those who comment. You can say anything you want and interact as you see fit. I've implemented OneTrue fan because it allows even more reader interaction. 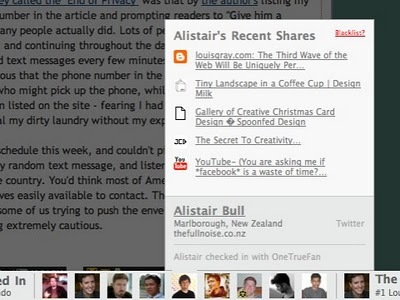 IF you look at the bottom of the browser as you scroll down you'll see a window that allows people to join the service for free and share the links that they have shared from the blog. Readers earn points for coming to your site each day, reading content, sharing links and driving traffic to your site. The ten readers with the most points show up in a leaderboard, but those points only last for 14 days. Readers need to keep coming back because fanship is an ongoing process. I think what I would like to do sometime in 2011 is offer prizes to readers in the reader board. I'll make an announcement when I know more information. Please feel free to follow the link below to learn more about the OneTrueFan service. Maybe you might like to add the service to your own blog(s). I bet some prizes would definitely get your readers coming back and reading more. Best of luck in the new year, from OneTrueFan! Project X: Second Coming Released!